All the drains are now out - last one came out yesterday. What a relief - I didn't realize how much movement they inhibit until I got them all out. I still can't shouldn't pick up the kids and sometimes the van door is too heavy (yes we have a van, we intend to fill it with noisy, boisterous, messy children) but we're getting there. Unfortunately on the left i have a fairly generous seroma developing, it has about 60 or 70ml I reckon and up until this evening wasn't sore at all. 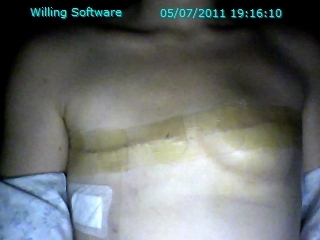 Now it is pulling in the middle and I look like my breast is trying to grow back (I wish!). I think there may be another small one under my arm but it is hard to tell and I am numb under there so I dunno. sorry about the seedy flash - it is dark in here! I had a phone call from my mum the other day who said she was talking to our cousin's husband. My cousin died of breast cancer in her early 30's. It seemed to happen really quickly for her, and this has been something I have desperately been trying not to think of. The last thing i need is only a year for ballpark survival. She had 4 kids and her youngest was only a baby - it was very very sad. So he called and spoke to Mum and obviously he was really gutted. But after talking to him Mum discovered that hers was definately a hormone driven one and by the sounds of it maybe HER2 positive. This was about 8 or 9 years ago, so the testing and of course Herceptin were not available as readily as now. I cried. I never realised that this was so worrying to me - to know that hers was different to mine means I won't follow her same path. But most importantly it may increase the likelihood that I am one of the very small group of non-BRCA gene related triple negative cancers. The idea that my sisters and mother may have to come to a decision about their own breasts is frightening. Two of my sisters have very young children and just starting on their families and the other is 21 and not yet begun. We are all breastfeeders and formula is not contemplated at all. To not have them have to do what I have done and am going to do is all I wish for. And to worry that my own children may have to seriously contemplate their own fertility later in life is mortifying. How do you tell your children as they grow that they may need to choose a family vs a 'just in case' situation. Look at your children and love their perfection, in case you ever find the plan is not what you imagined. Just to let you know Steph that you are the one who is an inspiration, and thank-you so so very much for your offer - we are honoured. Here's hoping Pip can help you do some work on that seroma. And 'glad' to hear about your cousin - not the right term but I'm sure you know what I mean. I'm in my forties,not a Mum,but so moved by you,your plight and your courage. Strength and love to you and your family.